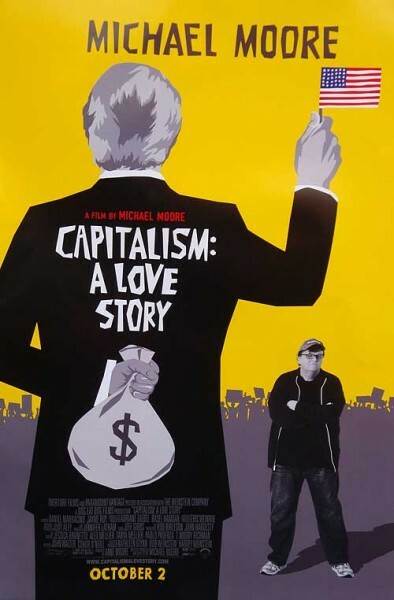 Movie Review:	Capitalism: A Love Story | Fight Back! Michael Moore has done it again, only this time he's coming out strong against the most pervasive evil in the United States: capitalism. Moore serves to moviegoers a searing critique of capitalism that is well needed during the worst economic crisis since the Great Depression. On Thursday, Oct. 1, a supportive crowd of 200 progressives and activists came to one of the many locations in Chicago showing Capitalism: A Love Story. The special showings benefited United Electrical Union Local 1110, the same local that carried out the historic Republic Windows and Doors factory occupation this past December. Capitalism: A Love Story is filled with comedy, satire, and chilling analysis of the economic crisis in the U.S. It highlights the American people's "love affair" with capitalism that ends in heartbreak for believers in the "American Dream". The film begins with a searing critique of capitalism, highlighting several U.S. propaganda films praising "free enterprise" and the "profit motive." Now with the current economic crisis, we know that Wall Street and financial giants such as Bank of America, Lehman Brothers, and Merrill Lynch are filled with greed, corruption, and deceit. Michael Moore skillfully argues that these characteristics are part and parcel of an economic and social system that is clearly bankrupt. Next Moore exposes the US Federal government's $700 billion bailout fraud last year, which was forced upon the American people by Congress under fear and bribery from the financial elite. Instead of a government that serves the people, Moore argues Capitol Hill is a corrupt collection of wealthy servants to the top U.S. CEOs. Democratic Party officials in particular are blamed for the passage of the bailout that gave billions to the banks and nothing to the people. The movie, in all its bleak observations, gives incredible hope to the American people. It features the fight back against housing evictions and foreclosures across the country - events mostly clouded over by the corporate media. The film shows stories of personal resistance, such as one family waiting to be forcibly removed by the sheriff from their home in Lexington, NC. The main feature though is the union workers' occupation of Republic Windows and Doors in Chicago. The occupation is historic in the sense that it is the first factory occupation in the U.S. in decades. Workers are looking back to the tactics used during the Great Depression. The film briefly shows footage of the sit-down strikes at the GM factory in Flint, MI, of the 1930s that gave birth to the United Auto Workers. The recent Republic occupation stands in the same tradition of the working class using militant tactics to struggle for a better livelihood. At the end, Moore implores the audience to take action, just as the workers at Republic, the families and poor in dozens of homes across the U.S., and protesters outside Wall Street are doing. This call is ringing in the ears of all those attending the special benefit on Oct. 2 in Chicago, as everyone signed up to get involved in union support work. The big picture in Capitalism: A Love Story is the contradiction between democracy and capitalism. The problem with this view is that there is democracy under capitalism - it is democracy for the capitalists, the bankers, business people, and investors whose money controls the government in a thousand different ways. What we need is democracy for working people and the poor. But this can only come about if the wealth and power of the capitalists is done away with, that is with a socialist economy, which will mean democracy for the people and an end to capitalist economic crisis.